most items taking 10 days right now. 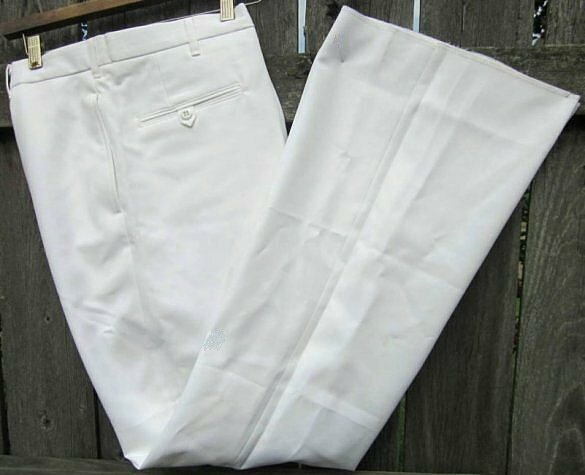 These long pants are made out of a flat polyester, no stretch. The waist is 37" for a 36" waist fit. The inseam is 35.5" with no hem/serged bottom. So if hemmed, they would be around 34.5" in length. Thigh circumference is approximately 25". The width at the bottom is 24". They are not costume. Real pants. There are two pale orange spots behink the right knee. I will spot treat and wash.
No returns at this time of year.